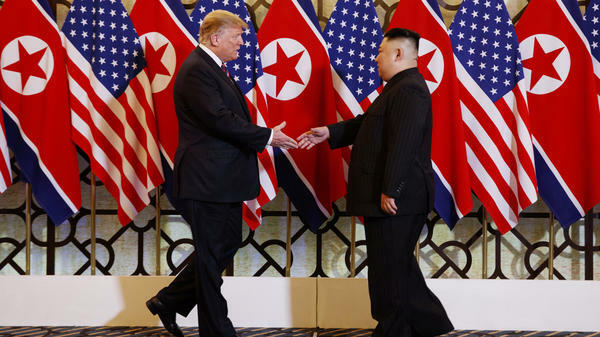 President Trump meets North Korean leader Kim Jong Un on Wednesday as their second summit begins in Hanoi. All false reporting (guessing) on my intentions with respect to North Korea. Kim Jong Un and I will try very hard to work something out on Denuclearization & then making North Korea an Economic Powerhouse. I believe that China, Russia, Japan & South Korea will be very helpful! The president said he was anticipating a "very successful" summit in which the two leaders would work toward denuclearization. He also said he hoped to build on the first summit, while touting the strength of his relationship with Kim. "We made a lot of progress, and I think our biggest progress was our relationship is really a good one," he said. Trump has said the ultimate goal of round two is for the regime to relinquish its nuclear program. When asked if he had walked back the goal of denuclearization, Trump said "no." Calling Kim "a great leader," Trump said North Korea has "tremendous economic potential" and "we will help it to happen." Through an interpreter, Kim referenced past hostility between Pyongyang and Washington. "However, we have been able to overcome all those obstacles, and here we are today," Kim said. "And I hope that we can provide an outcome that is welcome to everyone, and I am sure that we can do this." For its part, the North wants to secure relief from international sanctions. Reporters shouted questions as the leaders wrapped up a photo-op, including one about former Trump lawyer and fixer Michael Cohen ahead of his congressional testimony about alleged lawbreaking by his then-boss. Trump did not verbally respond. The leaders then headed off to what the White House called "a social dinner," with interpreters, as well as two officials from their respective countries in attendance. Acting chief of staff Mick Mulvaney and Secretary of State Mike Pompeo joined the president. And Kim Yong Chol, vice chairman of the Central Committee of the Workers' Party of Korea, and Ri Yong Ho, the minister of foreign affairs, joined Kim. The White House abruptly announced it was limiting media access to the dinner, which some perceived as an act of retribution for questions asked of Trump about Cohen. White House Press Secretary Sarah Huckabee Sanders said in a statement that "due to the sensitive nature of the meetings we have limited the pool for the dinner to a smaller group." A print reporter, radio pooler and photographers were allowed in for a short period. What the leaders discussed over shrimp cocktail, grilled sirloin and chocolate lava cake was not made public. "Great meetings and dinner tonight in Vietnam with Kim Jong Un of North Korea," tweeted Trump. "Very good dialogue." But with differing perceptions about what denuclearization means, getting both sides on the same page will be a challenge. Just days ahead of the summit, administration officials acknowledged they were still working to come to a "shared" understanding on the matter. It follows criticism that the first summit last June in Singapore achieved little progress toward denuclearization. In the past, North Korea has called for the U.S. to also remove its nuclear threats from the region. And Pyongyang has resisted giving a full accounting of its arsenal or full access to inspectors, moves that experts say are needed to verify that Pyongyang is giving up its weapons. On Wednesday ahead of the dinner, Trump said that he has been satisfied with progress in negotiations even though "some people would like to see it be quicker." 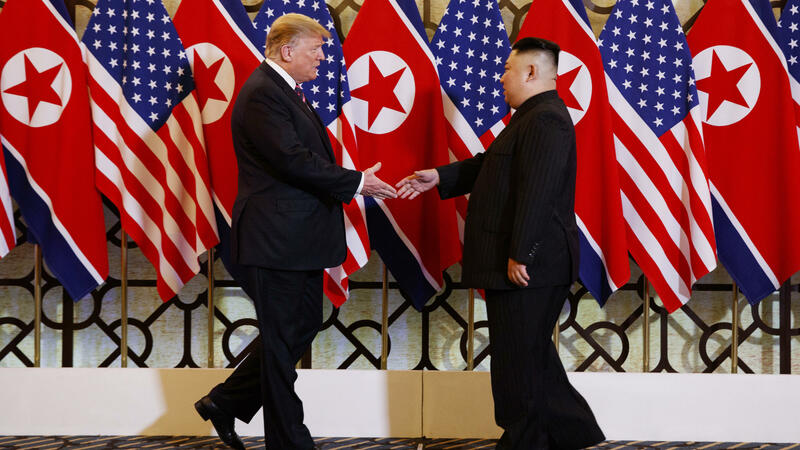 Jessica Lee, a senior director of the Council of Korean Americans, told NPR's Ayesha Rascoe that those expecting fast results from the summit are likely to be disappointed, but that the establishment of dialogue is key. "Both the United States and North Korea have to be a little bit less ambitious and more realistic when it comes to outcome, knowing that the eventual goal of eliminating nuclear weapons in North Korea is going to be something that takes years, if not decades," Lee said. NPR's Ayesha Rascoe contributed to this report.